These special Spanish Courses for Seniors are ideal for mature students and senior citizens who wish to combine a Spanish course with a program of cultural & leisure activities and excursions, to enjoy so much more than a normal holiday! You will work on your Spanish language skills with other adults, in a friendly and relaxed atmosphere. Malaga: a place where life is always enjoyed to the utmost. Spanish as the second most widely spoken international language, is nowadays as indispensable as English. Whatever your level of Spanish, your specific expectations, the time you have at your disposal for this Spanish language course, your dream destination, we certainly have a “tailor-made” language course to propose to you. The Spanish courses for seniors are enriched by a wide range of extra curricular activities, including guided tours of the city and surrounding areas, a cooking class, watching movies at the cinema, wine tasting and tasting of typical products in the Market. Compare: please go to “Prices and Dates“. The Spanish courses 50 + “Seniors” are aimed at those who want to share an experience of language study with people of the same age group. The classes will focus on the study of grammar, conversation and at the same time, some social and cultural aspects of Spain. 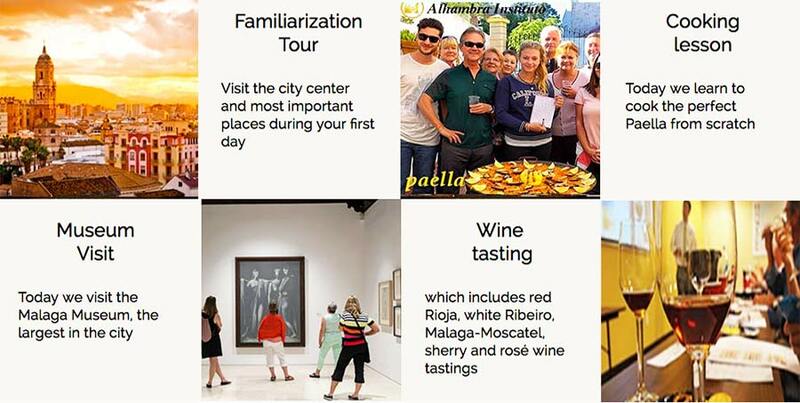 The first day of school students will have a panoramic visit of Malaga city center guided by a Spanish teacher. The students will take an entrance test to determine the appropriate level of study. The course includes 4 classes a day, from 9:00 to 13:00 with a break at 11:00. Each lesson lasts 55 minutes. Classes are taught by qualified native teachers with experience in teaching Spanish to foreigners. There are all levels from beginner to advanced. Accommodation: for Senior students wishing to completely immerse themselves in the language and culture of Spain our school offer accommodation with carefully selected Spanish families. Airport transfers: Pick up and drop off airport transfers will be arranged and are included in the price. Málaga has the fourth biggest international airport (AGP) in Spain. Socialising is a very important part of your free time when learning the Spanish language. 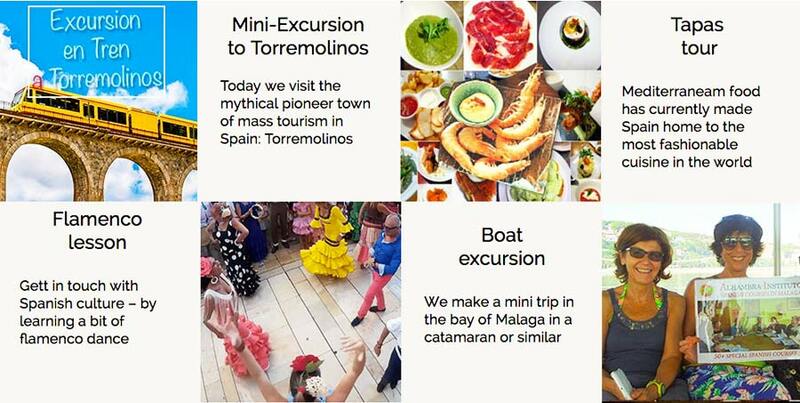 Here in Malaga we offer lots of events and excursions helping you to interact with other students as well as giving you the chance to be a tourist in this beautiful part of Costa del Sol, Spain. Spanish lessons always take place in the mornings, so what is there to do in the afternoons? You can use that time to do some self-study of course, or you could chill at the beach or at one of the many coffee-terraces around Malaga. All levels are offered throughout the year, from complete beginners to advanced speakers.